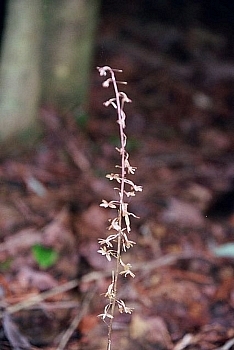 Left: Tipularia discolor leaves. 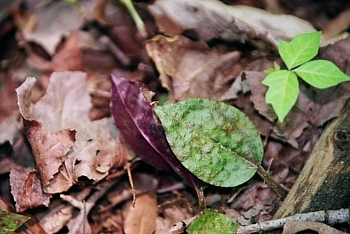 Note the deep madder-purple leaf to the left; that is the underside of T. discolor leaf. To its right is a rather "bumpy" looking leaf, which is the top of a T. discolor leaf. Flower color: greenish, tinged with madder-purple, numerous in an elongated loose bractless raceme. Range in New Jersey: Northern and middle districts and lower Cape May peninsula. Misc. : USDA lists as a facultative upland species.Usually occurs in non-wetlands (estimated probability 67%-99%), but occasionally found on wetlands (estimated probability 1%-33%). Leaf is 5-13 cm. long, disappearing before anthesis; often it is easier to find this plant in the winter by looking for its unusual leaf while all around it is brown. Leaf emerges in fall and persist through the winter, withering in the spring. Leaf is gone by the time it flowers. Stone notes: "This curious orchid was found in lower Cape May County a number of years ago by Mr. Joseph Crawford, but was not discovered again until detected by Mr. O.H. Brown, who has in the last few years found it at a number of scattered stations in the dark oak and pine woods of the lower third of the peninsula. The single leaf arises in autumn and persists throughout the winter, but perishes before the flowers appear. 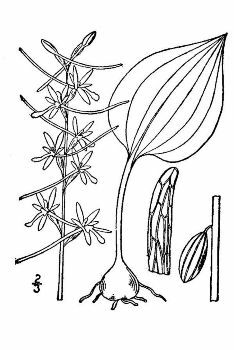 The absence of any foliage and the spidery character and obscure coloring of the flowers makes it an exceedingly difficult plant to detect.